I’m a woman (surprise!) and I love it when my husband takes me out on dates. We don’t get to go out much because we’ve always been tight on cash and we kind of enjoy just curling up on the couch with a movie. The longer we’ve been married, the harder it’s been to get out on a “real” date. We own a new business, Andrew works really long hours, we have a toddler, and by the time we have a moment to breathe it seems like too much of an effort to actually go somewhere. When we do finally get out on a date, you might think we were traveling to some exotic place by how excited I get, so I want to make the most of it. So, I want to share with you what I like as a woman out on a date. When my husband does these things, it helps me to enjoy the date that much more. So, whether you’ve been married for 50 years (way to go!) 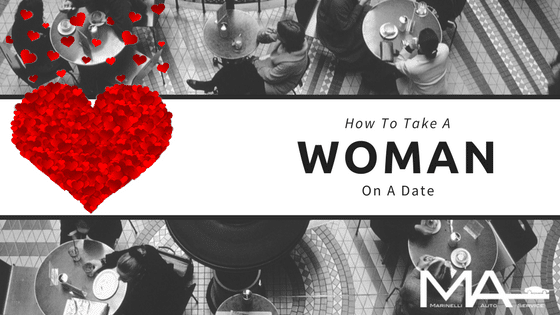 or are nervously looking forward to your first date, please take these dating tips to heart and woo your woman! You want your woman to be thinking about you, not the condition of your car. You don’t have to drive a fancy expensive sports car (Andrew and I drive a 1994 Toyota Corolla and a 2000 Toyota Tacoma respectively), but you should show her that you value and want to care for the things you own (which means you would value her even more for choosing to be with you). Moving old receipts, take out containers, and smelly gym clothes out of her seat as she stands there waiting to get in says that her comfort was a last second thought and doesn’t set a very good impression. Show her that you are practically and financially responsible. Work with your mechanic to stay on top of your maintenance schedule. Make sure your wipers work and your fluids are topped off. Fill up your gas tank. Don’t put off known problems. Having car problems is not something you want to be handling while you are trying to impress the woman you have eyes on. It seems so simple and even a bit archaic, but it’s a gesture that I love. Yes, I am fully capable of opening my own car door, but I love the idea that the man I’m with would try to impress me with chivalry. It shows that he puts me before himself and in return, I feel honored. Also, if I’m wearing a skirt and/or heals, I can be sure I don’t have a wardrobe malfunction in the process of getting in and out of the car. Hopefully the woman you are with is so stunning that you can’t keep your eyes off of her, but don’t let her beauty distract you from being a good driver. Pay attention to the speed limit and other road signs, but don’t just focus on the letter of the law – be a courteous driver, too. You see someone indicating that they want to switch lanes and traffic is heavy, slow down and let them in. Refrain from laying on your horn the second the light turns green and the person in front of you hasn’t hit the gas pedal, yet. Show her that you are a respectful person who tries to do the right thing. Is she wearing high heels? Did it rain earlier in the day? Watch where you park. Parking right next to soggy grass or by a puddle can be a predicament for a woman and her footwear. You don’t want to see the heel of her shoe sink into the grass or her shoe get flooded in a puddle of water. Additionally, if you’ve both gotten really dressed up, you are likely wearing a coat while she’s wearing a sleeveless dress. Make sure the temperature in the car isn’t freezing her out. Women tend to be colder than men on average anyway, so even if she’s smart and brought a light sweater, be sure you don’t have the AC too cold. My husband and I aren’t huge Valentine’s Day people. It’s nice to have an annual reminder to express your love to that special someone but we don’t get super excited about the holiday. We do, however, like to get away from everyday life and go on a date every so often – especially in this difficult season when so much is competing for our time and energy. I hope, whether it’s a Valentine’s Day celebration or another special date, that you can spend that time focusing on one-another and not the vehicle that drove you there.